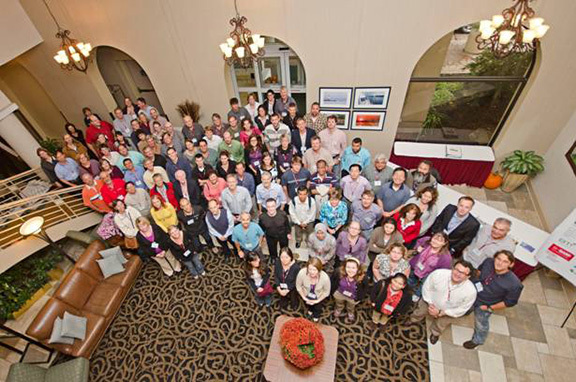 In mid-October, Tom Zitter convened the 26th Annual Tomato Disease Workshop (TDW) at the Holiday Inn in Ithaca, NY. One hundred nine tomato breeders, university researchers, extension and industry personnel worldwide participated in the one and a half day workshop. The goal of the TDW is to provide a forum for presentations of new products and recent research results targeting tomato diseases. Since initially started in the 1980s to discuss the occurrence of bacterial canker, the TDW has expanded to discuss all pathogen groups to include disease etiology, pathogen epidemiology, breeding for disease resistance, and use of chemical, cultural and biological disease management strategies. TDW26 this year was held during the same week as the Tomato Breeders Roundtable meeting (originally scheduled for Mexico), the SolCAP Workshop (Solanaceae Coordinated Agricultural Project) along with the SOL Genomics Network (SGN), and a specialty crops grant (SCRI) dealing with management of greenhouse tomato diseases. Featured speakers at the TDW on Wednesday were three speakers from BTI and from the Department of Plant Biology to discuss molecular aspects of tomato research ongoing on the Cornell University campus. A total of twenty eight talks were presented. The workshop organizers would like to thank our presenters, industry sponsors and participants for contributing to the success of the 26th workshop! Special thanks for their help in organizing this workshop are extended to Tracey Sherwood, Tracy Holdridge, Dawn Dailey O’Brian, Carol Fisher, Andrea Gilbert, Mary Kreitinger, and Kent Loeffler. Thanks are also extended to Brian Leckie and David Kalb for their help in driving the vans for the SolCAP participates.